Explanation: The above sky map tells us the universe is 13.7 billion years old -- but how? 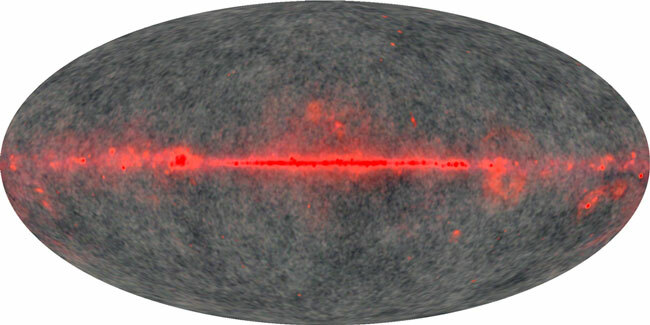 At first look, one only sees the microwave glow of gas from our Milky Way Galaxy, coded red, and a spotty pattern of microwaves emitted from the early universe, coded in gray. The gray cosmic microwave background is light that used to bounce around randomly but came directly to us when the expanding universe became cool enough for nearly transparent atoms to form. A close inspection of the spots reveals a slightly preferred angular distance between them. One expects such a pattern to be generated by sound emanating from slightly over-dense regions of the early universe. Sound waves will take time to generate such a pattern, and the present age of the universe can then be directly extrapolated. The above universe age is estimated to be accurate to better than 0.2 billion years. The above map was taken by the WMAP satellite orbiting the Sun at the L2 point, just outside the orbit of the Earth.